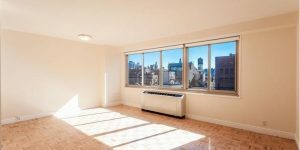 Spacious Renovated 2 Bed 2 Bath Apartment, Seconds from Union Square! 16th Floor, Amazing Views. Full Service Doorman Building! Great closet space. Lots of light. White cabinetry. Stainless steel appliances. Marble counter tops. Marble flooring. Marble bath. Strip flooring.